Being Frugal and Making It Work: Huge Cash Back deals during the Swagbucks Cyber Monday Sale! 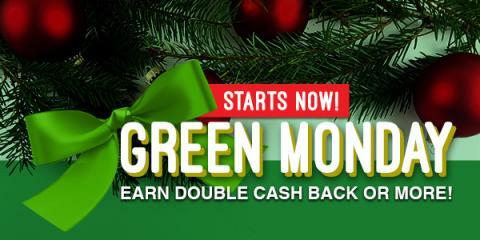 Huge Cash Back deals during the Swagbucks Cyber Monday Sale! You can earn money while saving it on all your big Cyber Monday purchases. The Cashback Shopping site Swagbucks is offering big cash back - 3x or more - at over 120 different stores today only. They're also offering big payouts on a varieties of different deals and offers from companies that would make great gift ideas. Get great deals without waiting in lines or even leaving your home! If you're not familiar with Swagbucks, they offer cash back in the form of points when you shop. Then you can turn those points into free gift cards to places like Amazon, Starbucks, Target, or PayPal cash. You can also earn points for discovering deals, watching videos, answering surveys and more! To take advantage of the cash back, just create your Swagbucks account when prompted (it takes less than 30 seconds) and then you're all set! As a special bonus, if you sign up through me you get a 300 SB ($3) bonus when you earn your first 300 SB before December 1st! This site's a great way to extend your shopping budget, especially around the holidays! What will you be shopping for on Cyber Monday? The Pre-Black Friday Holiday Sale! 2017 Holiday Gift Guide Seeking Sponsors! Perfect Photo Gifts for the Holidays! The 2017 Swagbucks Holiday Sale!